Cottage cheese appeared many centuries ago. People involved in the care of buffaloes and cows began to pay attention to the process of souring milk, eventually noting the formation of a product that many people on the planet are very fond of today. But even in the modern world, when cottage cheese is produced in factories, it still remains a product that quickly deteriorates. 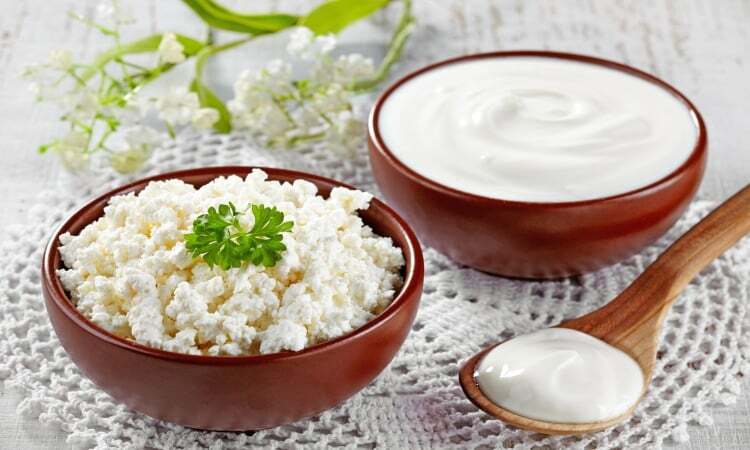 In the production of cottage cheese at the plants, preservatives are added to the curd mass - this is necessary in order for it to be preserved for at least several days. On the packaging of a quality product must be applied the final date of sale in grocery stores. But such a curd cannot be stored for a long time even at home, since it is a living product with constant fermentation processes. Because of this, the temperature and timing for the storage of a useful product make it possible to store the curd for a long time without causing damage to it. Buying cottage cheese in the supermarket you need to know the important points. First of all, the original packaging is removed, and then the cottage cheese is transferred to a bowl with a lid. It is necessary to choose the ware made of enamel or plastic. Only in this case it will be possible to keep the cottage cheese in the refrigerator, and it will not deteriorate over the course of 48 hours. There is also another advantage that allows to keep the cheese for four days - a section that keeps the temperature at + 8 degrees. In order to save the curd for a longer period, you can hold it in the freezer and then put it in the fridge on the shelf, the temperature should be no more than + 1 degrees. This will keep fresh cottage cheese for about a week. Many are interested in the question of how to properly store the cottage cheese in the freezer. It is important to know that the product must be in the chamber at a temperature of -30 degrees, which will allow it to be stored for up to 14 days. But in order to be able to consume such a curd in food, it must be removed from the freezer and placed in the refrigerator for 12 hours before cooking. In the case of using cottage cheese for cooking any products, you can simply leave it in a container for five hours. Directly such a product will not be taken. It is important to note that thawed cottage cheese does not need culinary processing. It is possible to use it in food immediately after it has been unfrozen. Cottage cheese is not recommended to be stored for a long time, because over time its taste will become worse, the taste of bitterness will immediately become noticeable. The reason for this is the constant vital activity of the product and the content of the starter microflora in it. If extraneous microflora appears in the curd, the correct temperature conditions are not observed, and the packaging material is of poor quality, this will lead to product deterioration. Only with proper storage of cottage cheese will not be able to face problems. And besides, it will be possible without fear to enjoy the wonderful taste of this healthy ingredient. Once upon a time, when people still didn’t know about refrigerators, they needed to come up with a way to store curd. For this purpose, it was thought to wrap the curd in a clean white cloth, which was previously wetted with cold water. After that, the product was placed in a cold place in which the temperature did not exceed 15 degrees. There is also another method of preserving the curd: wrap it in foil or parchment paper, put it in an enamel bowl and close the lid tightly. Most people are confident that if you put a few pieces of sugar in a bowl, you will be able to store this delicate product longer. Do not forget that the cottage cheese, which was stored in the refrigerator more than 24 hours must be subjected to heat treatment. If the curd is not fresh enough, then you do not need to eat it directly. There are many recipes that allow you to make delicious dishes from it, for example, cheesecakes, casseroles or dumplings. It should be noted that the products that include cheese in their composition, even in the freezer should not be stored more than 96 hours, as this will lead to damage. These products are pancakes, cheesecakes, dumplings, donuts, casseroles, cooked at home. This also applies to semi-finished products that are purchased in stores. We have considered many ways to properly store the curd, and you just have to choose for yourself the easiest and most convenient.